What usually happens on social media after a terrorist attack? A hashtag circulates beginning with "Pray for..." or "I am...". Users share images of the carnage, and people express an equal measure of sadness and defiance. 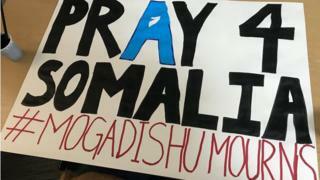 But after deadly attacks on Saturday in Mogadishu, which claimed at least 281 lives, some social media users have been asking where the solidarity for Somalia is, and why there are no trending hashtags like those which have emerged after attacks in the US and Europe. Saturday's truck bomb was the deadliest terror attack in Somalia since the Islamist al-Shabab group launched its insurgency in 2007. Some bodies were burnt beyond recognition. Of those who were identified, one of the victims was Maryam Abdullahi, a medical student who was due to graduate the next day. Heartbreaking stories like this are not dissimilar to those shared after violent attacks and natural disasters around the world when people lose their lives. Khaled Beydoun a professor of Law in Detroit, criticised the depth of media coverage in a social media post which has been shared hundreds of times on Facebook and more than 6,000 times on Twitter. "I hate comparing human tragedies, but the mainstream media makes you do it," he posted on Facebook. "There are no slogans claiming 'we are Mogadishu' and no catchy images floating around social media demonstrating solidarity." He is not alone in having this view. Between Saturday, when the attack took place, and the early hours of Monday morning the hashtag #IAmMogadishu had generated little over 200 tweets, but by Tuesday there were more than 13,000 tweets as social media users expressed their frustration over the lack of media attention the attacks were given. A number of vigils have been organised by Somali communities across the UK and US, including one on Tuesday organised by Kings College London's Somali society and assisted by UCL's Somali Society. Abdulkadir Elmi the President of the UCL Somali society said: "The main purpose of tonight is to show unity among young British Somalis. "Due to the lack of global solidarity we just want to show that there are people who do stand with Somalia." Despite the perceived lack of Western solidarity with Mogadishu on social platforms, Somalis themselves have been using the power of social media to mobilize support for charity efforts. Gurmad252 - it's name is a reference to "support" or "back up" - is a website established with the backing of the Somali authorities by volunteers, and the families of the victims to track and identify the missing on social media. A GoFundMe page was also set up by a Swedish Somali for funds to pay for a free ambulance service to help the affected. It has already reached its initial target of 100,000 Swedish krona (£9,351, $12,334). Many have also used the hashtags #weareone and #gurmadqaran to share details of charitable efforts, but the task of raising awareness on the internet is not easy in a country which was one of the last in the world to go online and where internet usage is still relatively low.